Ever thought to yourself, “I could do an IRONMAN® Triathlon if I had enough time to train and still have a life?” Well, you’re not alone. 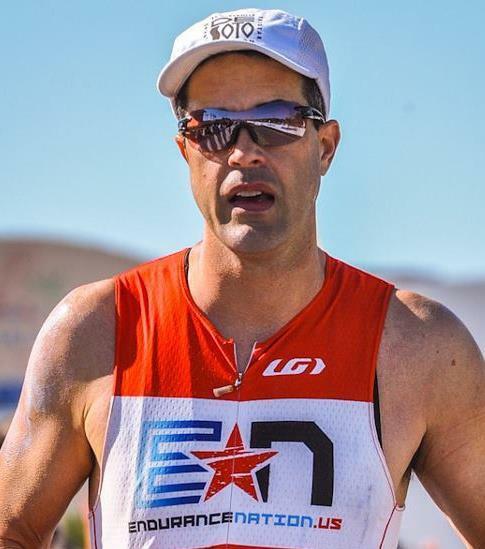 We recently interviewed Endurance Nation Ambassador, Scott Davis on this very topic. Scott juggles his own business and beautiful wife and children AND long course triathlon training. Through Endurance Nation’s methods, Scott is able to have it all. EN: What got you interested in triathlon? Scott: Since I ran track, cross country and swam competitively in High School (Oh how I wish I had those legs, and times back) combined with 2 years of College running and cycling for fun, I guess it was inevitable to put the three sports together at some point. Honestly, I had always wanted to do a tri since college, but never did. Once my daughters were old enough for me to do something, I competed in my first sprint triathlon in the spring of 2010. EN: What was your biggest concern going into long course? Scott: After my first sprint, I was hooked and wanted to go longer, but when looking at the traditional training plans, I didn’t think I had the time needed to properly train. EN: How did you hear about EN? Scott: In my research on IM training plans, this website kept showing up with an unconventional method of training. I am a believer in the mantra of “watch what everyone else is doing, and do the opposite” so it made since. The amount of hours needed to complete with one of Endurance Nation’s plans seemed achievable. EN: Did EN live up to your expectations? Scott: EN exceeded my expectations, and continues to because of the community of triathletes. From the person who has just started in the sport, all the way through team members who have won their ages groups, completed IM Kona, and so on, we have them all. Where else can you ask questions and gleen advice from some of the top level age groupers in the sport? The ability to not make the same mistakes someone else has made i.e. learn from their mistakes is invaluable both in this sport and in life. EN: What is the one piece of advice you would give someone who is searching for a triathlon coach? Scott: Check us out! Look at what value you get for your money within EN. I would put our coaches, and team members experience up against anybody in the business. EN: How has the EN structure given you time with your family and your business? Scott: My biggest concern with training for an IM was “I have a wife, two daughters, and a thriving computer graphics business that already requires 40+ hours week, How am I going to train for 40+ hours a week?” When I saw EN’s training philosophy, I said “This can work” Because the longest weeks we have are around 20 hrs/week? it has afforded me the time needed to still be available for work, to attend the various sports my girls are involved in, and still “have a life” outside of triathlon, without worrying whether or not I have trained enough to complete my race. I don’t know of any other plans that can say that. Scott: I feel honored to be an Ambassador to THE BEST TRI TEAM there is. I am currently training for IMCHOO which will be my third IM race, IMFL 2011, IMLT 2013. I feel that through EN, I have learned how to make the best use of the engine that I have on race day. I am 46 yrs young, have an awesome support team that includes my 17 and 15 year old daughters, and my beautiful bride, that allow me to do this crazy sport. I own a computer graphics business that specializes in creating online configurators for the home fashions industry, enjoy all thing tech (Yeah I’m a Techno Geek) and am involved in the local Tri Community in the “Piedmont Triad” Area. Through EN, I have become good friends with several people, some that I have yet to meet in person! EN: Describe your first long course season of training and how the finish line felt? Scott: My first race was IMFL in 2011, and I pushed my body physically like it have never been pushed since my days of swimming in HS, but never felt like I couldn’t finish a workout. That was also my first EN Blue Ridge Training Camp where we climbed over 30k feet in 4 days. I remember asking Dave Campbell (a fellow EN’r) who had completed IMFL how it compared, and he said if you can do this climb, the IMFL bike course is going to seem easy. Since I had never completed a stand alone marathon, yet alone a marathon after 2.4 swim, 112 bike,and the longest run I did in training was just shy of 13 miles, I was a bit apprehensive to say the least. Did I mention that I am a slow dude when it comes to running. But, I executed my run based on our protocol, and crossed the finish line feeling like I had just climbed Mt. Everest! There is a reason why inside the team we say #workworks because, Folks IT WORKS! EN: What keeps you training and racing? Scott: Honestly, I just enjoy it. I thrive to set an example for my two daughters that they can accomplish anything with the right attitude, and work ethic. Thank you for reading, we invite you to share on your social media channels and step inside the team for a FREE 7 day trial!